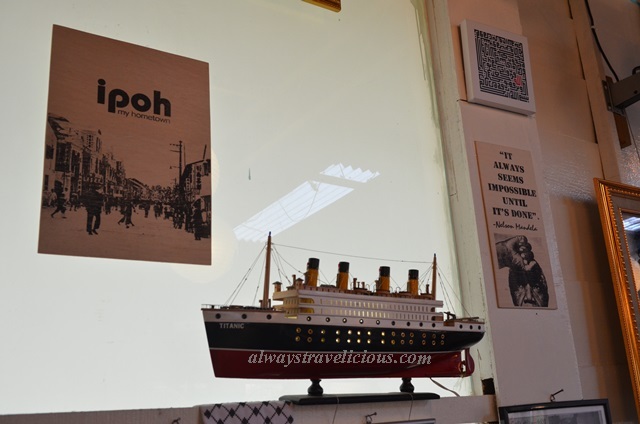 Thumb's Cafe @ Greentown, Ipoh - Always Travelicious ! Looking very similar to a Malay kampung house, Thumb’s cafe serves a mix of Malay and Western cuisine. Old fashioned with yellow wooden windows, vintage floral curtains and cushy couches, it’s the kind of place you would expect some comfort food. The cafe literally has a positive note to it – with many inspiring and positive quotes on the walls. The interior is mostly vintage with DIY furnitures and sofas from the bygone times, made lively with the spherical chic lamps dangling from the ceiling. 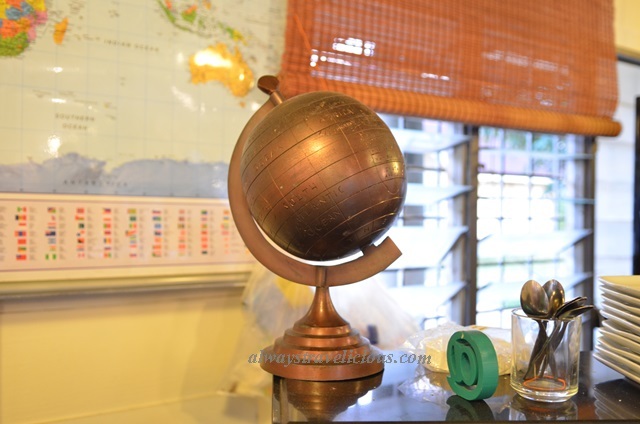 Subtle travel motifs are throughout the cafe, with travel books and old suitcases lying around. Some section of the cafe is more contemporary, with the working counter that reminds me very much of Plan B.
I ordered the extremely affordable lamb chop at only RM 13, smothered in luscious gravy, adorned with coleslaw salad atop and cushioned with spiced potato wedges underneath. It was a chunky piece of lamb once I’ve swept away the salad. The lamb was cooked well-done and it didn’t have a chewy texture like most well-done lamb would have. Unfortunately, the lamb had a lot of fat on it and I am under the impression that food is already prepared before you order, as the lamb chop and potatoes came lukewarm. The chicken salad (RM 6) was refreshing with fried chicken bits, chunky apple slices, orange slices and a sprinkle of deep fried minced garlic. 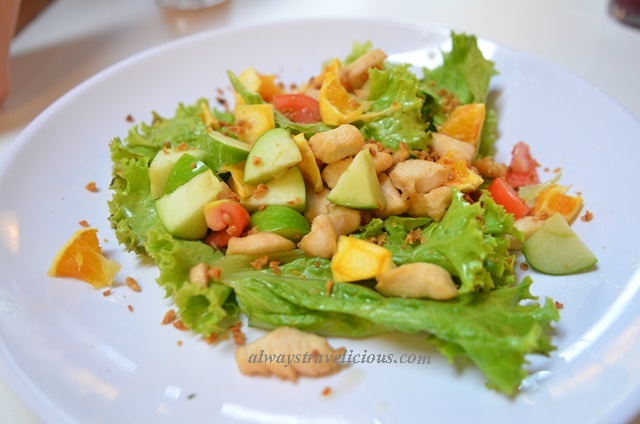 There wasn’t much salad dressing, only the natural juices from the fruits – which I think would have been enough to carry the dish without the fried garlic, as the combination of garlic and fruit juice didn’t quite jive for me. 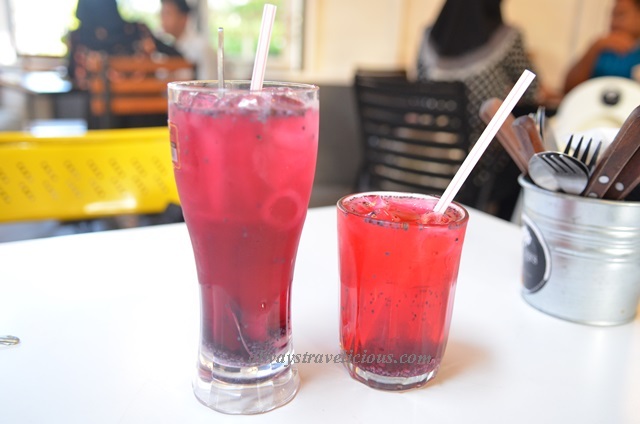 I enjoyed the drinks immensely – Ribena Selaseh + longan (RM 3.20) on the right and Sirap Selaseh + asam on the left (RM 1.40). I haven’t really tried any “selaseh” drinks in Malaysia because I don’t see them much on menus so it was fun with the basil seeds. Overall the cafe has very affordable pricing compared to most of the new cafes in Ipoh. Food could have been fine tuned but then again, that’s probably why the dishes are priced not as premium. The atmosphere is enjoyable in an old-schooled way, and the method of cooling is old-schooled way too with fans and only one air conditioner that seems to be working very hard with all the windows open so it was still quite warm when we visited around 6.45 pm. I didn’t mind the warmth too much but some may find it too warm. I think the cafe might be at its best at night, when it’s much cooler, and glimmering with all the spherical lamps . Address: 133 Jalan Sultan Abdul Jalil, 30450 Ipoh, Perak, Malaysia. Opening Hours : 6pm – 1 am. Tuesday – Sunday. Closed on Mondays. This looks so inviting. I love the mismatched furnishings. That’s a mind-boggling post! I scanned it quickly and can say I love the cozy feel of lived-in, non-decorator furnishings for a cafe. But I need to spend more time on that post. It’s great. Thanks for the link! Lots of hipster cafes on the list. Nice new profile photo you have ! hehe. I used to have something similar too !